경주 보문동의 부부총(夫婦塚)에서 출토된 신라시대 한쌍의 금귀걸이로, 길이 8.7cm이다. 태환이식이란 가운데를 빈 공간으로 하여 무게를 가볍게 한 귀걸이를 말한다. 귀걸이의 몸체가 되는 커다랗고 둥근 고리에 타원형의 중간고리가 연결되었으며, 그 아래에는 나뭇잎 모양의 화려한 장식들이 매달려 있다. 커다란 둥근 고리에는 거북등무늬와 같은 육각형으로 나누어 그 안에 4엽 혹은 3엽의 꽃을 표현하였는데, 꽃 하나하나에 금실과 금 알갱이를 붙이는 누금세공법(鏤金細工法)을 이용하여 섬세하게 장식하였다. 밑부분에는 나뭇잎 모양의 작은 장식들을 금실을 꼬아서 연결하고 장식 끝에 커다란 하트모양을 달았다. 신라 귀걸이 장식에는 대부분 이처럼 서역(西域)에서 전래된 누금세공법이 사용되었는데 그 중에서 태환을 비롯한 전체에 누금세공법을 사용한 가장 대표적인 것으로 화려하고 놀라운 세공 기술을 보여주고 있다. 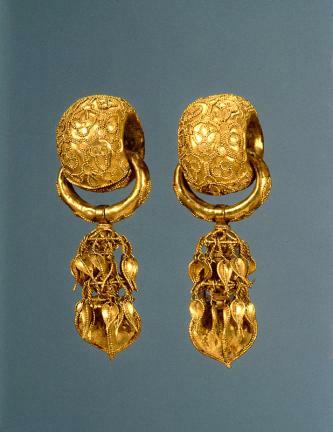 This pair of gold earrings with length of 8.7 centimeters was excavated from an ancient tomb of Silla (57-935), now called Bubuchong (“Tomb of the Couple”), in Bomun-dong, Gyeongju. Each earring consists of thick, hollow ring at the top, interlocking, thinner ring, and double-tier clusters of tiny leaves plus a large, heart-shaped pendant at the lowest part. The large hollow rings have the surface ornately decorated with three or four-leaf designs contained in hexagonal shapes of tortoise shell made using the filigree and granulation techniques. The hanging ornaments of the lower section are further embellished by tiny gold granules. 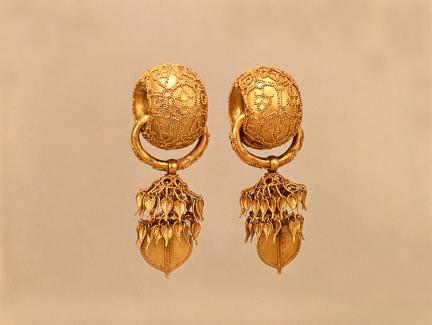 Most of the gold earrings of Silla discovered so far are decorated by the filigree and granulation techniques introduced from the Southwest Asian region. 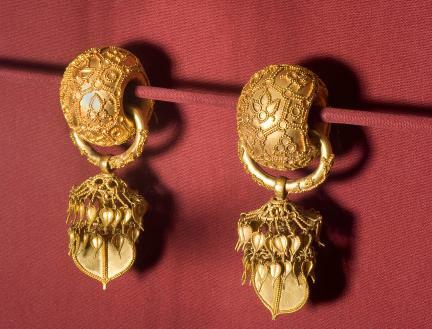 In particular, this pair of earrings is highly regarded for the lavish filigree and granulation ornamentation covering the surface of all parts.